WASHINGTON, DC -- The Trump administration is seeking to intensify its involvement in the 2014 Minsk agreements in the hopes of bringing the military conflict in Ukraine to a close. Ambassador Volker spoke on Monday at the Center for the National Interest about defusing the Ukraine crisis. To achieve that goal, Washington aspires to implement the agreements by championing a phased approach that would permit United Nations peacekeepers to patrol the Donbass region while Kiev would undertake a series of reforms to address the grievances of the local population. “What we have proposed is for a U.N. mandated peacekeeping force to go in and replace Russian forces and the separatist entities and create a secure space for a period of time where you can have local elections, where amnesty would be granted, where special status is granted,” Amb. Kurt Volker, U.S. special representative for Ukraine negotiations, said during a lunch meeting at the Center for the National Interest on Feb. 26. Volker said that he is happy with the United States’ position on the proposal. But he stressed that until now, there have been few tangible results. “We’ve been at this for about seven months, and I have to say that I’m very pleased with the positioning, but I am not pleased with the results because there are no results,” Volker said. He emphasized that what is transpiring in Ukraine is anything but a frozen conflict; rather, combat continues. Kiev loses a soldier about every third day, Volker noted. The fundamental problem is that Moscow is skeptical of Washington and its intentions—as Volker acknowledges—particularly with regard to sanctions relief. However, the Trump Administration hopes to offer Russia relief for sanctions that are specifically related to the Minsk agreements. “Russia is going to be very skeptical about U.S. sanctions relief,” Volker said. Moreover, there is no clear gain for Russia if it chooses to withdraw—only some of the sanctions would be lifted while Ukraine would continue to drift toward the West. Nor is the United States willing to rule out future NATO membership for Ukraine. Volker stated that Washington cannot dictate such matters to sovereign states. Thus, it is unclear what approach Moscow might adopt after Russian President Vladimir Putin’s reelection campaign. But no action is likely on the part of Russia until the elections are resolved. There are indications that Moscow might escalate the conflict rather than deescalate, as Center for the National Interest president Dimitri K. Simes noted. There are powerful figures in Russia who are in no mood to make any concessions to the West. 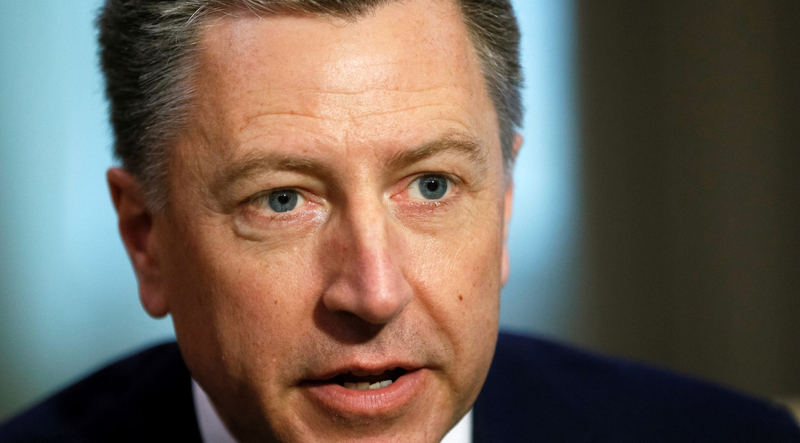 Asked if an all-out Russian escalation might be a possibility, Volker said that he does not believe the Kremlin has the military capacity to launch a full-scale conventional invasion of Ukraine. “The prospect for increasing the conflict is just too costly for Russia even if you are talking about asymmetric warfare,” Volker said. As such, Volker believes that the United States can achieve its goals via negotiations—where Washington has two primary goals. First, Washington hopes to restore Ukraine’s sovereignty and territorial integrity. Secondly, Washington hopes to ensure the safety and security of all of Ukraine’s citizens regardless of ethnicity, nationality or religion. To achieve Washington’s policy goals, the United States has clarified the language it uses to describe the conflict in Ukraine. Instead of obliquely referring to a conflict without mentioning the Kremlin, the Washington now directly refers to the areas under separatist control as being Russian-occupied, Volker said. Further, the United States has worked with its European Union partners to strengthen the sanctions regime against Russia. Volker said that the United States has worked with Europe to coordinate those sanctions to have the most direct impact on Moscow and the Kremlin’s inner circle. What’s more, the Trump administration has approved the sale of lethal weapons to Ukraine in contrast to the policies of the Obama administration. But the policy break is not as sharp as many might expect, Volker said. “There is what I view as an artificial distinction between lethal and non-lethal military equipment,” Volker said. “To give you an example, a counter-battery radar as provided by the Obama Administration allows you to identify where mortar fire is coming from and to improve your targeting to attack and kill them—whatever it is that is shooting at you—much more easily. That’s non-lethal and an anti-tank missile, which sits in a box and doesn’t get used unless you have a tank coming at you, is lethal. The reason for the policy change from the U.S. perspective is to demonstrate to Moscow that it will not make further territorial gains in Ukraine without incurring significant cost. “Russia’s not going to make further gains in Ukraine territorially,” Volker said. That means that Russia will be stuck with the expense of occupying the Donbass region—plus the added cost incurred by tightening American and European Union sanctions. “It’s all for nothing,” Volker said. With a Russian-backed force invading in the east, however, Ukraine’s disparate regions are more united and more nationalistic than ever before in history, Volker said. Indeed, Ukrainian youth—who have never lived under a unified Russian Empire or Soviet Union—are especially hostile and suspicious of Russia. “That psychological change in Ukraine is significant and much deeper than Russia ever expected,” Volker said. Thus for Russia, in Volker’s view, there is no gain to be had in Ukraine—only additional cost. Volker believes that the Russia hopes to extract itself from what he believes is a fruitless conflict in Ukraine. The key steps would be for Washington to coax the Ukrainian government to grant special status to the Russian-speaking Donbass regions while also deploying U.N. sponsored peacekeeper to take control of the region while it is reintegrated back into the rest of the country. In exchange, the Russians would get some sanctions relief for their efforts. While the sanctions relief would be relatively small, Volker said that it would be valuable because it is one area where there could be a U.S.-Russia agreement. “This might be an area where we could agree,” Volker said.